The Vi-CELL XR (Extended Range) Series Cell Viability Analyzer provides an automatic and cost effective means to perform the trypan blue dye exclusion method. This data is essential to the decision-making process for basic tissue culture cell passage and maintaining optimum culture conditions in bioreactors. Cell and tissue culture applications in life science research, including recombinant protein and biopharmaceutical production, require the accuracy, precision and automation available only in the Vi-CELL analyzer. The Vi-CELL automates the widely accepted trypan blue cell exclusion method. Historically, cell viability determinations were performed manually and has major shortcomings. In comparison, the Vi-CELL automatically performs the trypan blue with video imaging of the flow-through cell. Results are obtained in minutes. Product features include automation of the standard trypan blue assay, % viability, total cell concentration, total viable cell concentration, mean cell size, real time cellular images, bioprocess monitoring, validated reagents, convenient reagent pak. 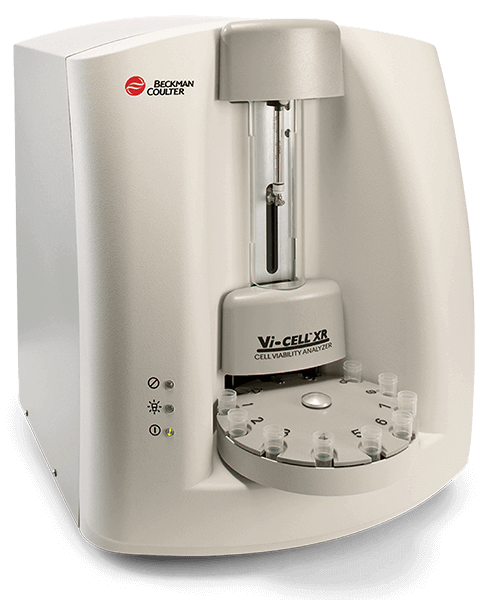 The Vi-CELL XR offers additional benefits over the S and AS Models, such as extended size range to 2 microns, allowing additional analyses of yeast, and smaller cells. Plus, increased sample throughput with greater efficiency and reduced sample volume results in less reagent use. Auto focus capability increases instrument ease of use. Variable aspiration and mixing cycles optimize results. Enhanced image magnification provides unparalleled cellular detail. Circularity measurement helps isolate debris from cells.